Whew, it's been interesting last couple of days around here. On Friday the only antenna I had in the sky was my OCF dipole for HF. Saturday morning found myself, Bob N3PPH, and Dave W3PQS erecting a pole with antennas for 2m, 70cm, and 23cm. With the ARRL August UHF contest starting at 2PM (local) we had to scramble. Okay, so I was a little late getting on the air. First QSO went in the log at 3:09 PM. 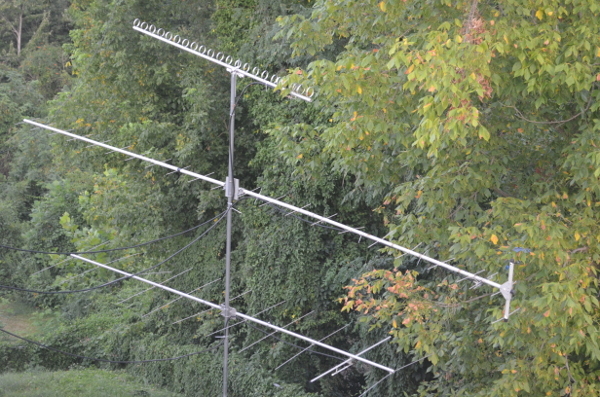 I operated, off and on, until 2:00 PM on Sunday and ended up with 18 QSOs, representing six grids and six states, all within ~500 km. Best DX of the weekend was K1GX in FN31 with a door-to-door distance of ~493.9km. Best 23cm DX of the weekend was K1TEO with his powerhouse station at a distance of ~405.3km. K1TEO was very loud during the entire event. When I went searching for a place to call CQ (usually around 432.107 MHz) I had to give him clearance as he was constantly in my ear. WA3QPX was also armchair copyable and we chatted for a bit during the contest. K3TUF gets the 'easiest copy' mention on 1296MHz. We chatted using SSB on 1296.100 MHz without too many problems. I pay little attention to the score I generate in these contests as I am more interested in the number of contacts and the distances I can work. With my small station, and with my off-and-on operation, I managed to rack up 324 points. Obviously not a winning score but with my antennas stuck pointing at FN (basically pointing at Connecticut) and running 50 watts on 432MHz and 10 watts on 1296MHz I say I did okay.